This incisive article on the repeal of civil liberties first published by Global Research in August 2006, brings to forefront of debate the ongoing road map towards Police State in America. It of particular significance with regard to the nomination of William Barr to the position of Attorney General. We are dangerously close to a situation where ~ if the American people took to the streets in righteous indignation or if there were another 9/11 ~ a mechanism for martial law could be quickly implemented and carried out under REX 84. The Cheney/Bush administration has a plan which would accommodate the detention of large numbers of American citizens during times of emergency. The plan is called REX 84, short for Readiness Exercise 1984. Through Rex-84 an undisclosed number of concentration camps were set in operation throughout the United States, for internment of dissidents and others potentially harmful to the state. The Rex 84 Program was originally established on the reasoning that if a “mass exodus” of illegal aliens crossed the Mexican/US border, they would be quickly rounded up and detained in detention centers by FEMA. And there you have it ~ the real purpose of FEMA is to not only protect the government but to be its principal vehicle for martial law. This is why FEMA could not respond immediately to the Hurricane Katrina disaster ~ humanitarian efforts were no longer part of its job description under the Department of Homeland Security. It appears Hurricane Katrina also provided FEMA with an excuse to “dry run” its unconstitutional powers in New Orleans, rounding up “refugees” (now called “evacuees”) and “relocating” them in various camps. “Some evacuees are being treated as ‘internees’ by FEMA,” writes former NSA employee Wayne Madsen. Be forewarned ~ the Cheney/Bush administration will stop at nothing to preserve their power and their ongoing neocon mis-adventure and they have currently proposed having executive control over all the states National Guard troops in a national emergency. The provision was tucked into the House version of the defense bill without notice to the states, something Vilsack said he resented as much as the proposal itself. Under the provision, the president would have authority to take control of the Guard in case of ” a serious natural or manmade disaster, accident or catastrophe” in the United States. Do remember, to the Cheney/Bush administration ~ the Mob at the Gates that they truly fear is not terrorists but, instead, the people demanding the truth. MINDFULLY, 2004 – There over 800 prison camps in the United States, all fully operational and ready to receive prisoners. They are all staffed and even surrounded by full-time guards, but they are all empty. These camps are to be operated by FEMA should martial law need to be implemented in the United States and all it would take is a presidential signature on a proclamation and the attorney general’s signature on a warrant to which a list of names is attached. . . The Rex 84 Program was established on the reasoning that if a “mass exodus” of illegal aliens crossed the Mexican/US border, they would be quickly rounded up and detained in detention centers by FEMA. Rex 84 allowed many military bases to be closed down and to be turned into prisons. Operation Cable Splicer and Garden Plot are the two sub programs which will be implemented once the Rex 84 program is initiated for its proper purpose. Garden Plot is the program to control the population. Cable Splicer is the program for an orderly takeover of the state and local governments by the federal government. 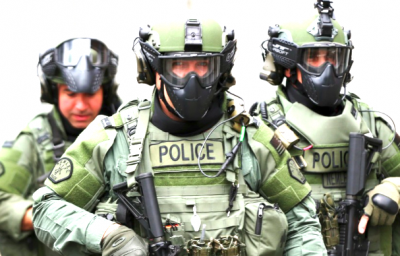 FEMA is the executive arm of the coming police state and thus will head up all operations. The Presidential Executive Orders already listed on the Federal Register also are part of the legal framework for this operation. The camps all have railroad facilities as well as roads leading to and from the detention facilities. Many also have an airport nearby. The majority of the camps can house a population of 20,000 prisoners. Currently, the largest of these facilities is just outside of Fairbanks, Alaska. The Alaskan facility is a massive mental health facility and can hold thousands of people.